You know those old couples who sit out on their front lawn side by side in folding chairs and watch the neighborhood goings-on? Yeah, that was us. Except we were watching other people work on our house. Our driveway, to be precise. It finally made sense to replace the driveway, and I think it might be one of the most joy inducing house projects for the Chief. 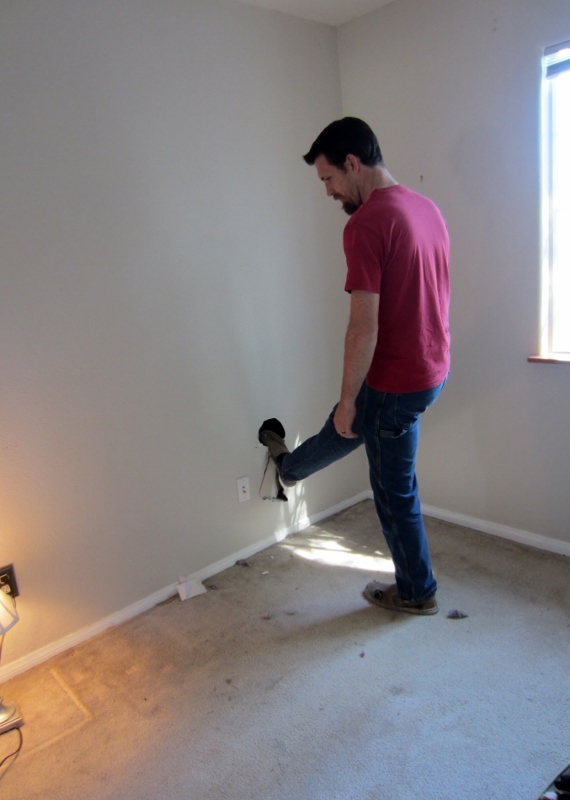 Not only was Someone Else doing the work on his property, it was going to make his life a million times more comfortable. It would let him work under cars comfortably as well as simply and easily roll out a tool cart, an engine lift, a jack, without the hassle and danger the old asphalt presented. 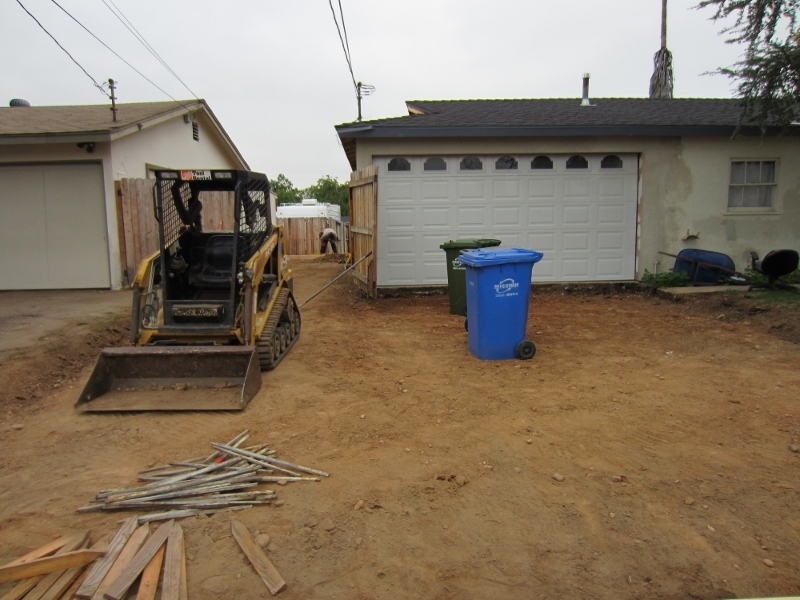 To keep costs down, he did all the prep work of removing the old paving and creating the foundation and forms for the concrete. This included spraying the dirt down to make it easier for the mini-earthmover to remove it. You can see how far down he had to dig – about 6″. 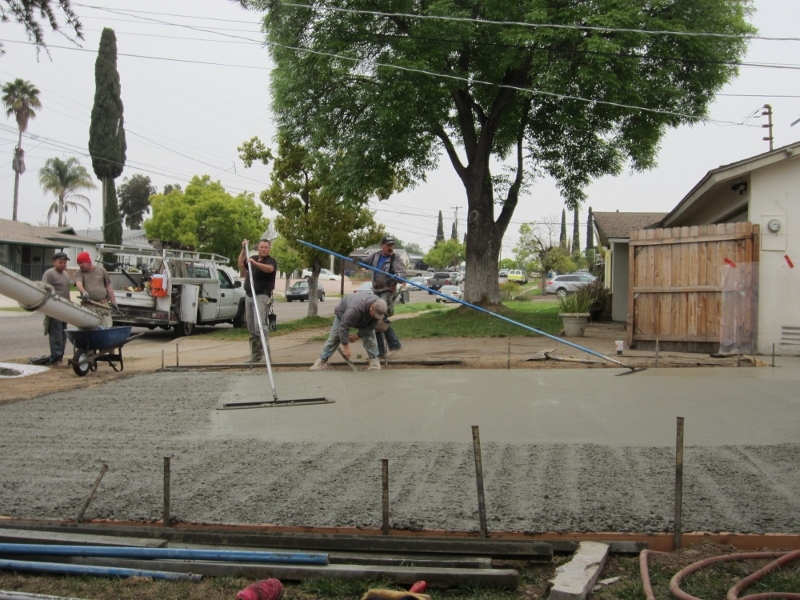 We did not use rebar in this pour because metal is a lot more expensive than cement right now, and it is cheaper to do a 6″ slab of concrete (very thick and sturdy) than to do 3″ of concrete with rebar. With the driveway all dug out and prepared, it looked about like this. The forms have not yet been installed here but it gives you the wide angle picture. About 6:30AM on Saturday, a half hour before they were scheduled, the crew and first concrete truck arrived. The Chief sprang out of bed and went to go over the morning’s plan. They taped up plastic on our house and the neighbor’s to ward off splatters, then backed the concrete truck to the far end of the driveway. Here’s the very first cubic foot being poured! By 7:15 we were out back in our folding chairs, sipping tea and coffee respectively, and having a wonderful time watching the guys make our driveway look 1000 times better. 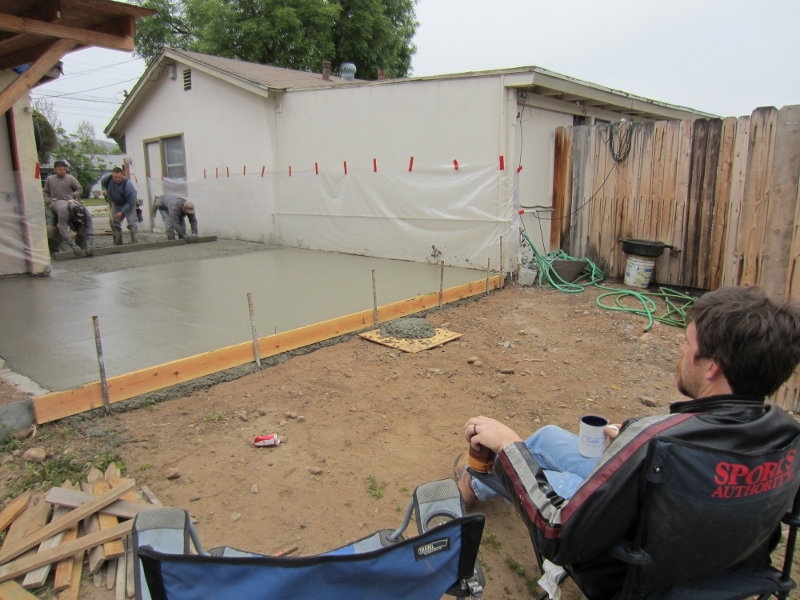 After a while we relocated to the front yard to watch that part of the pour. 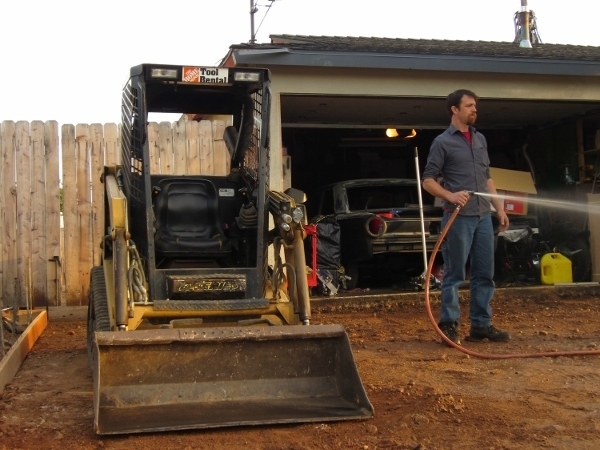 Here the crew is leveling out the driveway. After leveling, they float it with two different types of floats (flat paddles on long poles) that push the gravel down and make the surface of the concrete smooth. Once the concrete has been floated, expansion lines are marked to create some give in hot and cold conditions. 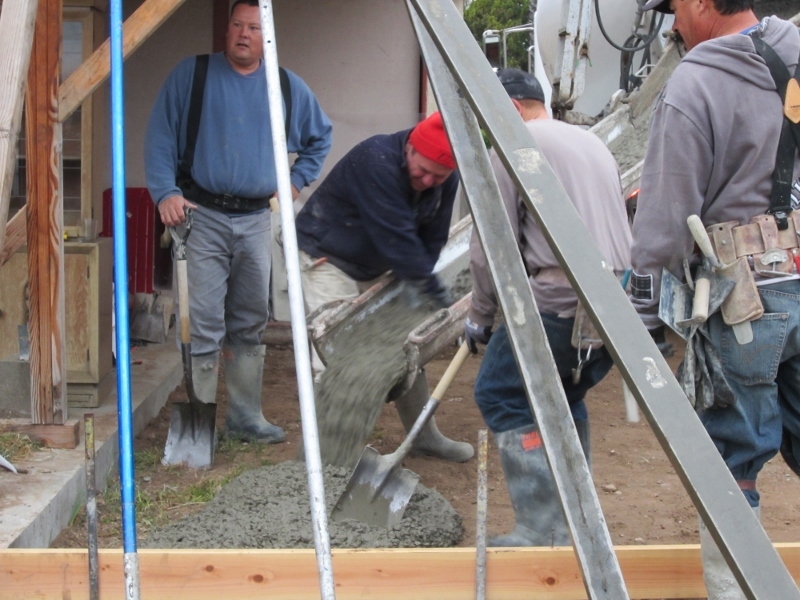 The weather was blessedly perfect for pouring concrete – not too hot, not too cold, cloudy and damp but no rain fell. This gave them plenty of time to work the concrete into a perfect finish before it started to harden. From start to finish the whole job took about four hours. 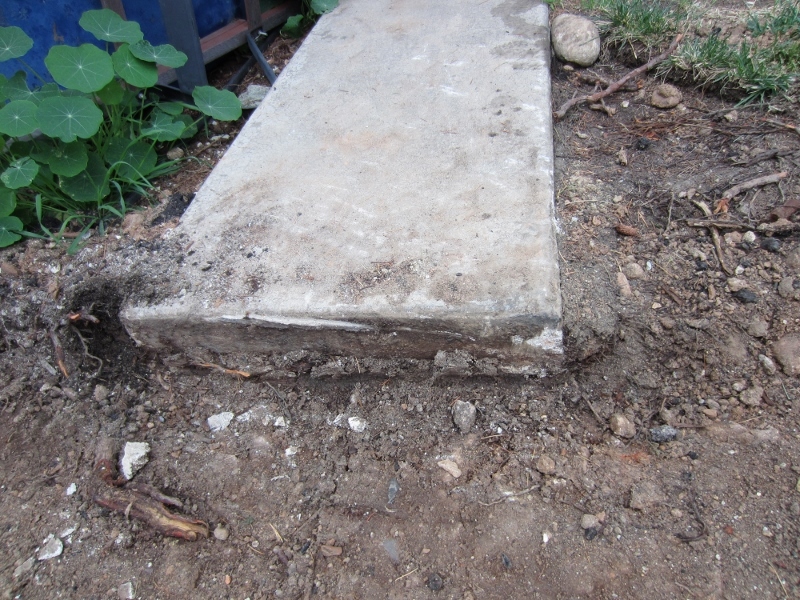 It took EXACTLY two cement mixers’ worth of concrete. 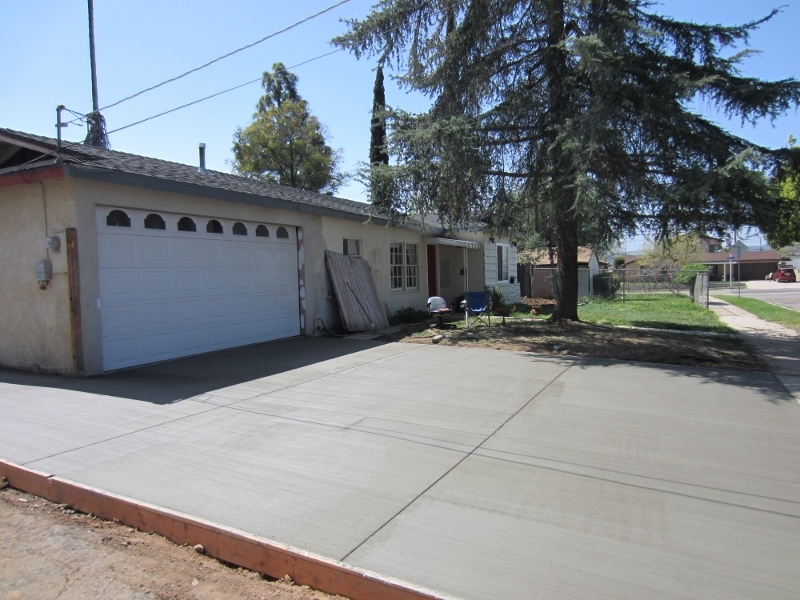 We were nervous we’d be a measly couple of yard short and have to tap into the third truck we had on call, but with a little bit of smoothing the crew was able to fill the last spot and still have one or two shovelfuls of concrete to spare Here is the final product. That’s a massively improved driveway, don’t you think? I’m remembering how just over a year ago we replaced the warped wooden garage door and beam with a new steel I-beam and a beautiful automatic garage door. 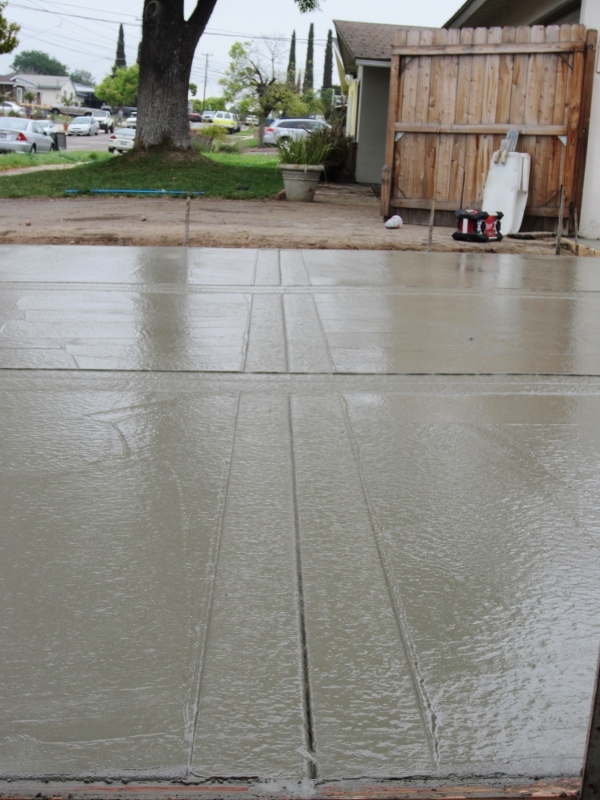 With this new driveway poured, I think we’re about done with this part of of the house. Our neighbors have been giving us thumbs up as they drive by, so everyone is a fan and we’re the rock stars of the week on our street. That feels pretty good! Next up: maybe we’ll finally take that 5 gallons of exterior paint and and repaint the house at last. 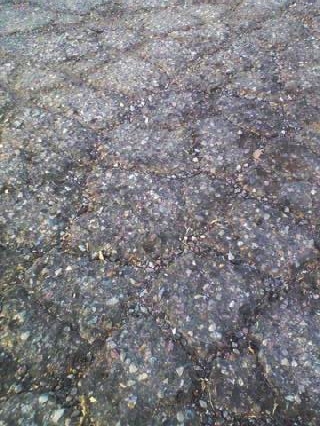 Till then, I never thought I’d be so pleased with a broad expanse of concrete paving. How do you like our new surface? 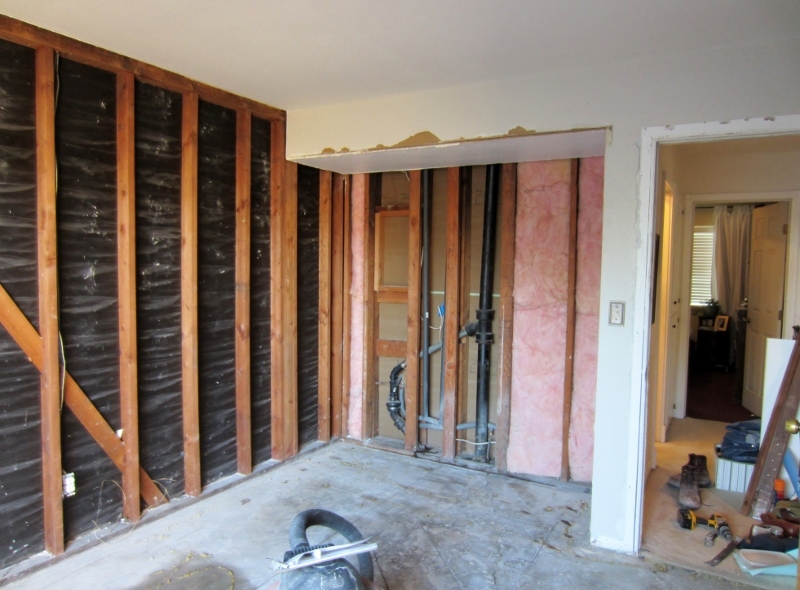 I think it’s about time I gave you a proper post about our granny flat remodel project. granny flat, n. Self contained accommodation within or built onto a house. The Chief and I have dreamed and planned since we got married of paying off our current home and expanding it as our family grows. When we eventually move, we’d like to keep it as a rental property and source of income. The next steps we have planned over the next 3-5 years are to convert and expand the covered patio into a generous master bedroom and bath, and to build two rooms onto the back of the house for a mud room/laundry room/project room and a man cave. The first step, though, is to get our house generating some income by renting out part of it as a granny flat. The Chief is excited because this is allowing him to expand the plumbing and electrical capacities of our (1 bath, 1020 sq. ft) house and put in “everything this house should have had in the first place,” according to him. We’re remodeling with cash from our recent refinance and consider it a permanent upgrade as well as an investment to produce rental income. I loooove planning and designing stuff, and the Chief prefers execution, so we’re a good team. I work on graph paper and think about things like sightlines and traffic flow in the rooms, and he looks at my plans and tells me what might need to be tweaked to work with the realities of where joists and pipes and such are. This granny flat idea has already gone through several changes on paper over the last two years (yes, I think that far ahead!) but basically here’s where we stand as we break ground. 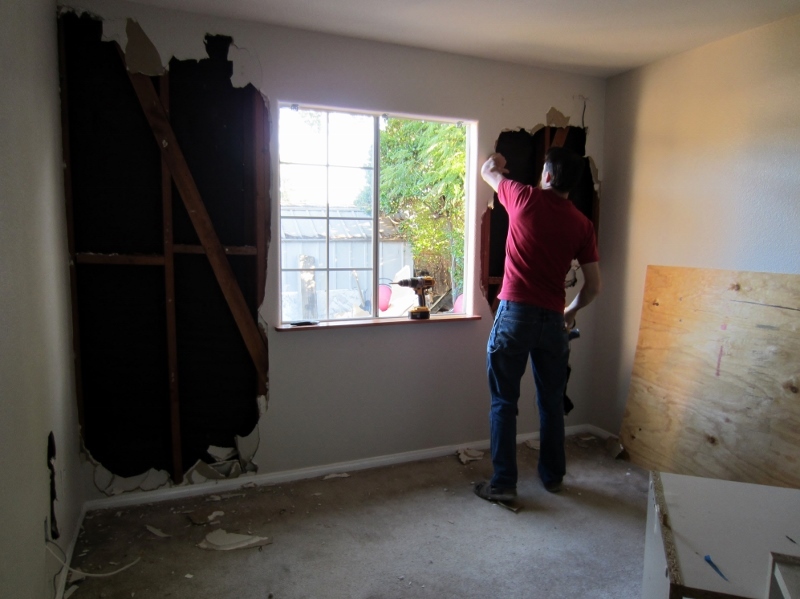 This is the “before” corner of our house that is getting remodeled. The main room has been our bedroom and is now becoming the granny flat. 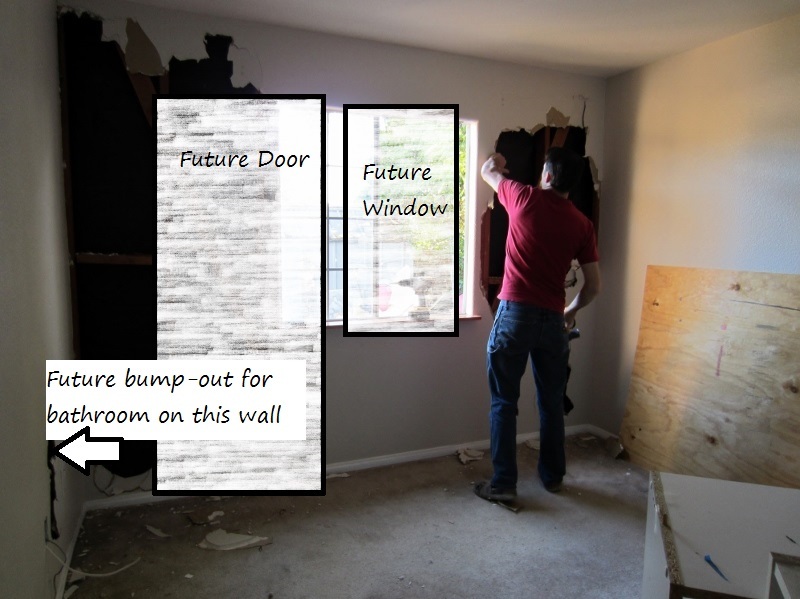 To orient you, the bottom wall with the window marked in it is the wall in the above photo. 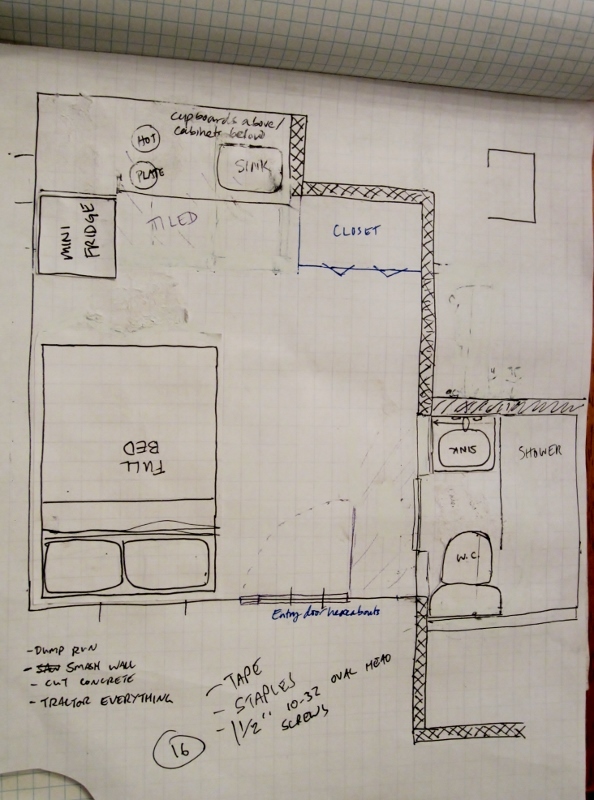 Now here is the plan with the changes we’re going to make structurally – walling it off from the rest of the house, busting into the covered patio/storage room to add a full bath, putting a door and new window in the south wall, and adding a kitchenette and closet. The way we work, there will probably be some minor tweaks regarding placement and dimensions of things as we see what fits with the situation as we go. For instance, we will probably do an under-counter fridge rather than a slighly larger free standing mini fridge as pictured above, and the door might not go precisely where I drew it. Because the Chief is so handy, we can make it work that way! It’s fun and sometimes we get our best ideas when we’ve already gotten halfway into a project. We currently have a TON of projects happening in and around our little home. I’ve got one more month till my due date, which means we now have somewhere from 0-6 weeks left to run around doing projects like chickens with our heads cut off. I am definitely feeling a bit overwhelmed and I know the Chief is too! There’s just so much in an in-between state right now, and we both would like more time to rest. Here’s a sneak peek of a couple of the things that are going on. The Bedroom: We’ve moved into the front bedroom and though there are still some piles of things we don’t know where to put, we got the basics in place. 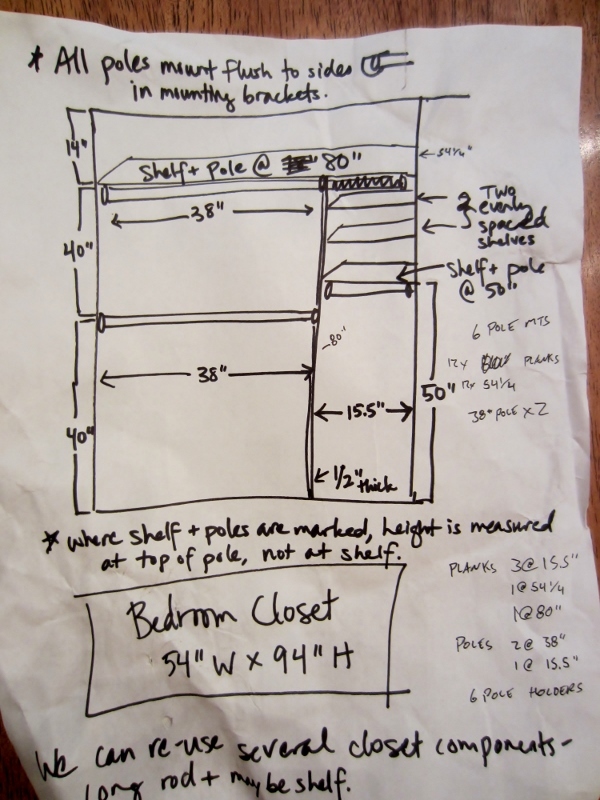 Most notably, we managed to fit all our clothes into a smaller closet. 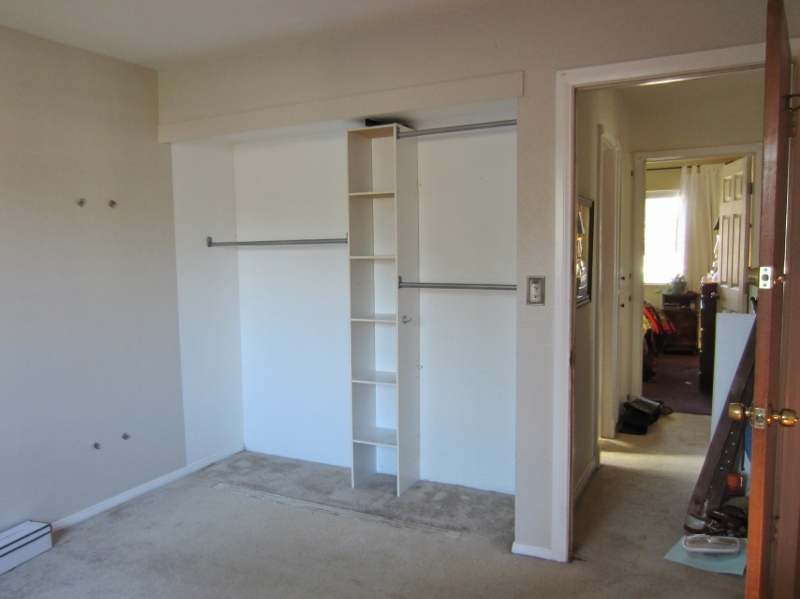 Here’s the nice big closet we shared previously – and you can see down the hall into the front bedroom that we’ve moved into as we cleared out this room. 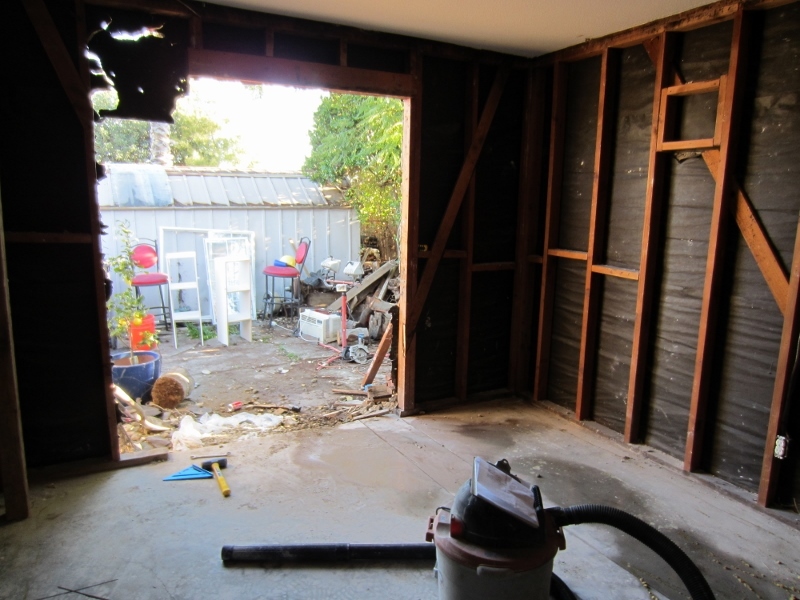 The Granny Flat: Major demolition has occurred. 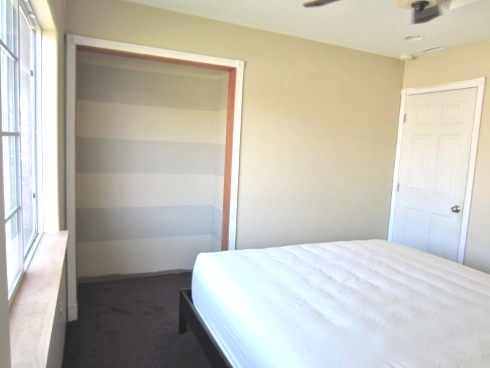 Here’s what the room used to look like when it was our bedroom. Here it is getting demolished. The Driveway: And last but not least, the very old, very crumbly, cracked, and pitted asphalt driveway is being replaced with blessedly smooth concrete. The Chief took it all out with a mini bobcat and sometime this week the new one ought to get poured. Pictures to come on this one. We’re busy! I hope you enjoyed a glimpse of the many things keeping us on our toes. 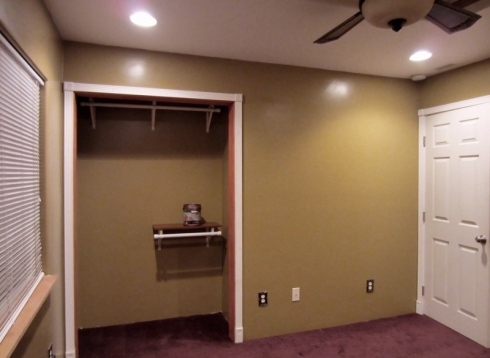 What Color Paint Goes With Burgundy Carpet? As I explained recently, we’re converting our old bedroom into a granny flat and are moving into a front bedroom… which we will be sharing with our newborn in about six weeks. This room is the same size as our old one but with a smaller closet, a much bigger (new! cal king! memory foam!) 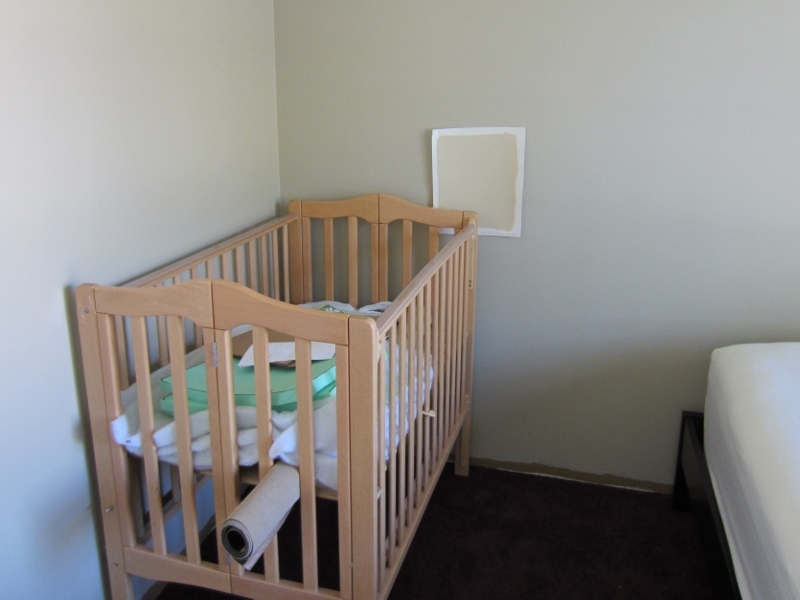 bed, and of course adding in Baby’s mini crib. Yikes. 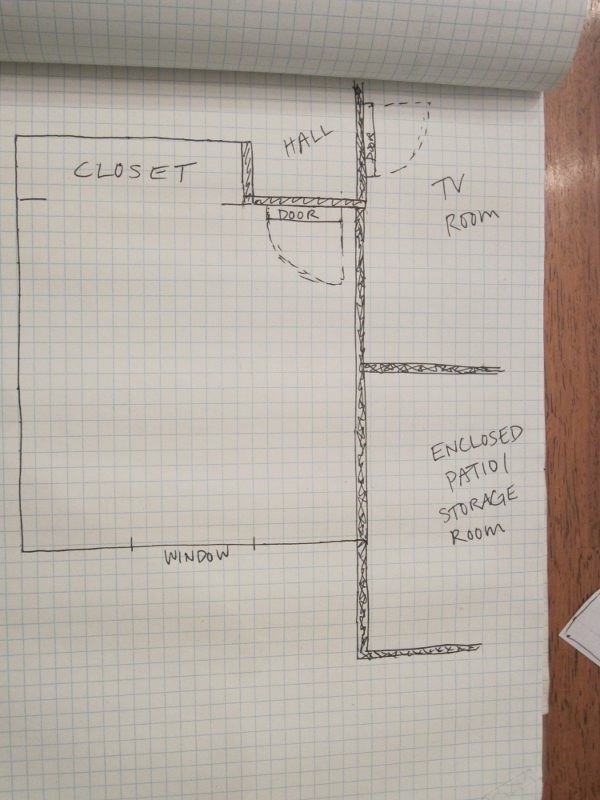 Anyone up for a decorating/organizing challenge? Let’s get going! First challenge: the perimeter. In this room the walls had been painted a semi-gloss yellowy brown, and the carpet… well, you could spill a full glass of wine on it and no one could tell. Up till now it’s been called the PBJ Room, as in Peanut Butter & Jelly. In our old bedroom I painted three times in the space of a week before I was happy with the color. 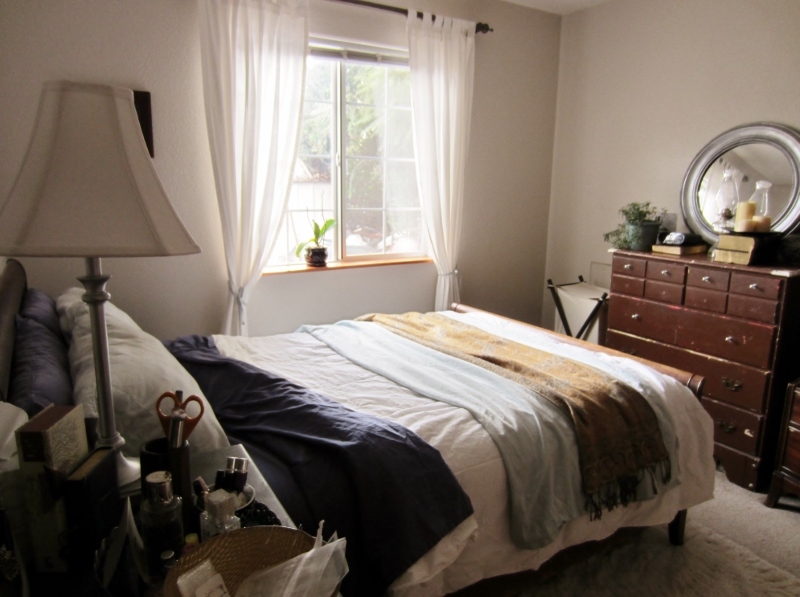 Between then and now, I’ve learned so much about identifying undertones in complex neutrals and was stoked to get the chance to try out my color skills on this new bedroom with the difficult carpet color. How’d I do? Read on! That carpet is a very bossy color and not one I love, but it’s staying because it’s in great shape, cushy and stain resistant, plus we only plan to be in this room for about a year. I can’t cover it with a large rug because the door has absolutely zero clearance and I can’t justify the expense anyway. The orangey stained wood trim at the windowsill and closet will stay despite my fervent wishes to paint it white, because the Chief won’t let me. It’s that guy thing about not painting wood, especially trim he put in himself. Gentlemen, hear us: not all wood is good. Sigh. He didn’t hear me. Maybe I can photoshop it and convince him. Maybe I can stain it walnut? But I did get to repaint the walls. I already gave you the end of my story by posting about how I was looking to gold-and-burgundy rooms for inspiration, but it took some time to arrive there. After at least five trips to the hardware store over the last month to try out chips and paint samples, I settled on a green-gray that didn”t fight with the carpeting, looked nice yet not chilly in the cool northern light, and would be a good neutral background for the bedding and decor I have in mind. Whites and off-whites were too pale in this room – there is not enough light for them to look anything but dirty and sad. 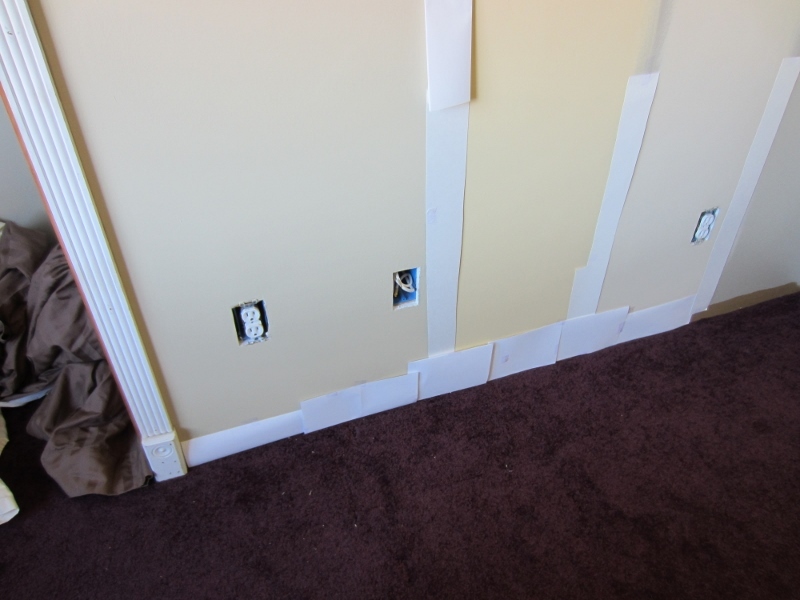 Did you know that’s what happens to light colored paint in dim lighting conditions? Behr Basic Khaki was the first paint color I used to repaint, this time in an eggshell sheen. On the chip without anything to compare it appears tan-khaki like a pair of pants, but in this room, with this light, next to this carpet, it definitely looked olive gray. I bet you would like to see the tranformative value of $30 worth of paint right about now. So much better, huh? Yeah, the carpet is burgundy, but it looks fine with the gray walls. I used Behr Ultra (Paint & Primer In One) to avoid having to do a coat of primer. That paint is sticky and kinda hard to work with, but my one coat plan worked. It looked great. I was happy. My hubby, who had been noticeably quiet as I worked, finally confessed that he hated the color and that it reminded him of the face of someone who was about to throw up. WHAT. I brought the candle and paper to the Depot and grabbed all the color chips that were similar. After several comparisons in the room with different light during the day, I narrowed it down to three and got samples to paint on the wall. As I came in throughout the weekend to check them again in different light, I’d go, Ahhh, what a nice color on the wall, why are we changing it? Oh yes, he hates it. 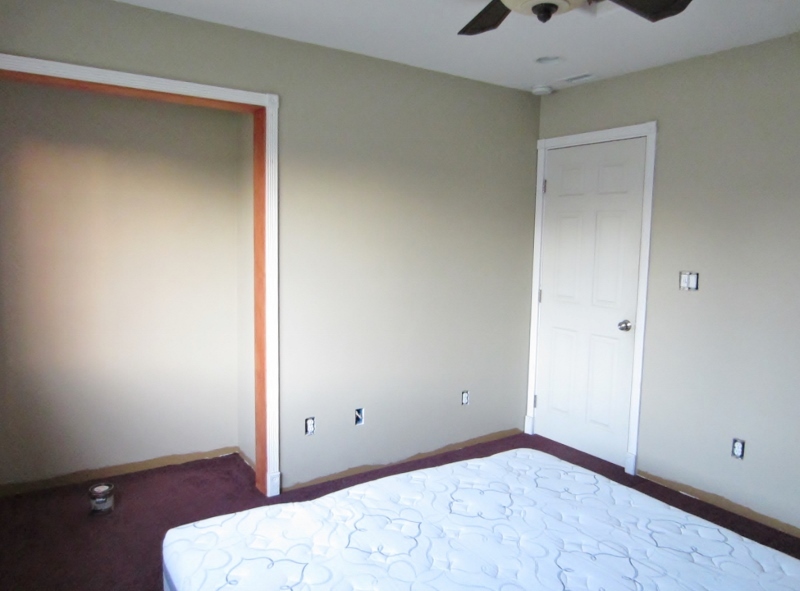 You get the best idea of a paint color when you surround it by pure white and put it next to what is in context, in this case the carpet – leaving it bleeding into the old wall color really does throw your impression of the color. The clear winner to me was on the far left, though I suspected the Chief would prefer the golden tones of the middle sample which was indeed the case. He was okay with my choice, which is more tan and goes a bit gold when the sun hits it, so that’s what we finally went with – Martha Stewart Toasted Marshmallow, color matched in Behr’s paint & primer in one. Here is the same color on the other side of the room. Whenever I buy a sample of paint nowadays, I make myself a large color sample on a piece of posterboard. It is SO much more accurate than a tiny, printed paint chip. I can pull out my growing stash of large samples and see if anything I’ve previously tried would work in a new space, without having to re-buy a sample or actually put paint on the wall. We repainted this weekend, and here is the After! 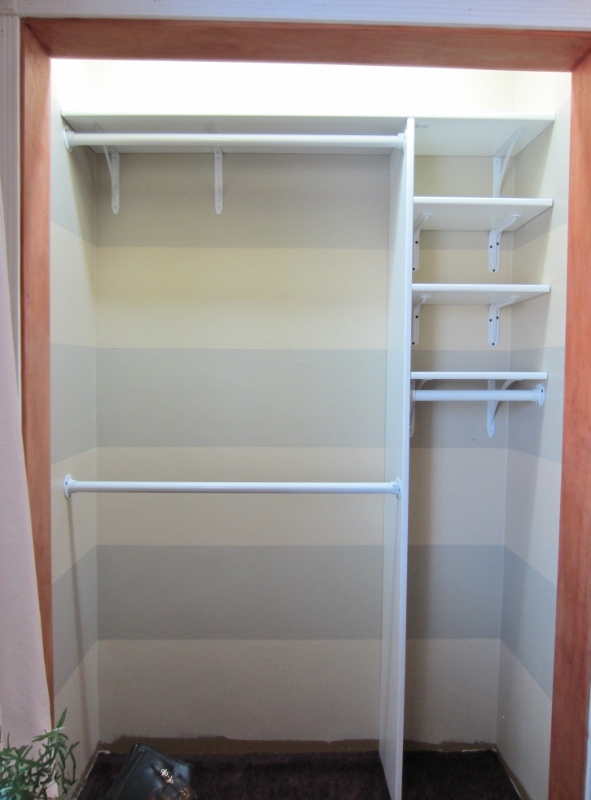 I decided to do stripes in the closet for the heck of it and left the gray paint in there, then taped off stripes to paint the new Toasted Marshmallow color. 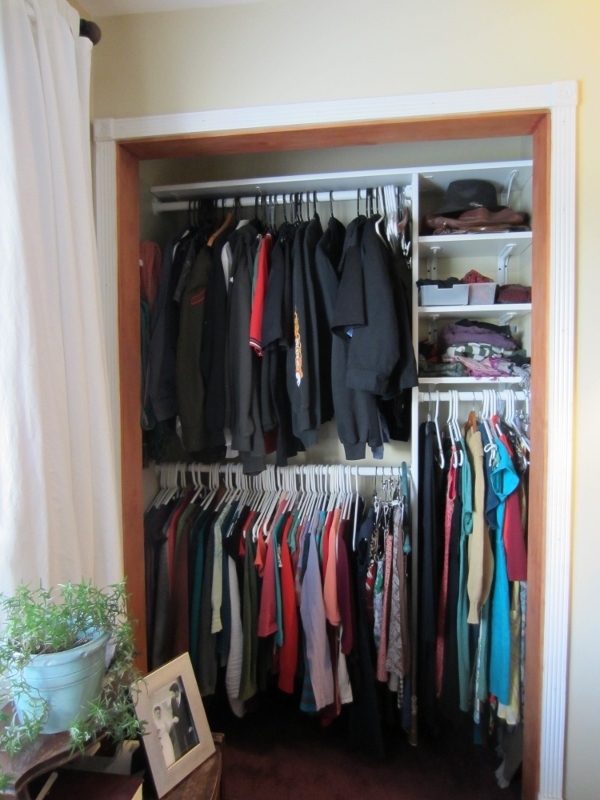 It will just be a sneak glimpse when we get into the closet for clothes – a fun surprise. We BOTH love this new toasty shade of tan and feel warmly welcome in our new bedroom. Do you know, this is the darkest I’ve ever painted a room before? I gotta get out more. I’ve never used beige or tan or teal or whatnot. Off-white, pale vanilla custard, and pale gray-brown are the colors I’ve chosen so far in other rooms of the house. I’m thinking our north-facing living room needs a shot of that gold that is the middle paint sample on the wall in the earlier picture. 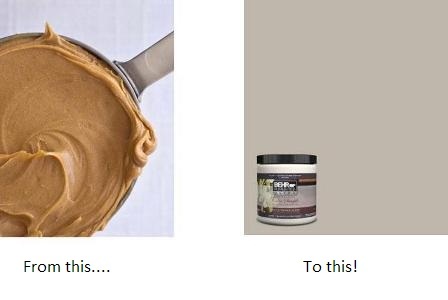 Its current vanilla-custard is too wimpy. Hey, our bathroom is deep red with gray tile and looks awesome but it was done by the Chief before we met. Whew! That was way too hard. But we got it done, so now let’s get some furniture in here!! What do you think of the changes? And is the gray trend replacing the beiges of yore in your home?